With the New Year on the horizon, it’s time to start planning a 2019 trip to Niagara Falls. But when is the best time to go? We break down what to expect from a Niagara Falls summer, Niagara Falls winter and everything in-between. 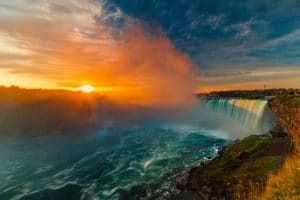 Read on for things to do in Niagara Falls Canada all year-long, from a visit to Niagara wineries, to checking out Niagara Falls botanical gardens. Spring is paradise in Niagara Falls, when the area experiences a plethora of bright colours via gorgeous flowers that emerge throughout the area. Niagara Falls botanical gardens and attractions like the Centennial Lilac Garden are stunning in spring, and there are plenty of places to wander to find beautiful spring flora. You can find yellow daffodils at the Queen Victoria Park, with so many of these flowers that Niagara Falls has earned the nickname of the “Daffodil Capital of North America.” There’s also a Floral Showhouse that has thousands of springtime flowers up for viewing, and a Floral Clock that is constructed with fresh flowers. Niagara Falls in spring also welcomes Springlicious, an annual event with a free outdoor music festival, artisan fair, street food and family activities. The event happens toward the end of spring. There’s also the Niagara Falls Elvis Festival, happening April 26-28, 2019, with Elvis competitions, shows and food. Temperatures range from highs around 42°F to 76°F from March through June, dipping down to lows of 24°F to 56°F. You might catch a bit of snow from March to April, but then temperatures start to warm up as summer approaches. Niagara Falls summer is the peak tourist season for Niagara Falls. Temperatures are ideal, averaging around the low 70s to low 80s for a high and dipping down to the high 50s for a low average temperature. Be prepared for humidity, but you can always cool off on the Hornblower Niagara Cruises ride. Lots of summer sunshine means brilliant Niagara Falls views complemented by blue skies and rainbows. You can also find plenty of roadside fruit and vegetable stands along the lower Niagara Parkway, where you can also hunker down for a picnic. There are summer events every day in Niagara Falls, but two to plan for are Canada Day and Fourth of July. On Canada Day July 1, there’s a parade, live music, entertainment and fireworks. America’s Independence Day is also celebrated on the Canada side of Niagara Falls, with fireworks and a special red, white and blue Niagara Falls illumination show. If you’re a wine fan, autumn in Niagara Falls may be the best time to visit. Niagara wineries are in harvest season in fall, so you can sample some of the best wines the wineries have to offer. The 67th Niagara Grape & Wine Festival takes place from September 14-29, 2019, featuring wine park events, a wine parade and special discovery passes that provide unique wine experiences throughout the Niagara Falls wine region. Is beer more your drink of choice? Niagara Falls hosts Oktoberfest every year, too. Entry is free, and the event includes German foods and beer, plus live entertainment from German musicians and dancers. The Canadian Thanksgiving takes place in early October, but you can also celebrate Halloween October 31 in Niagara Falls, or partake in American Thanksgiving over on the Niagara Falls Canada side. Niagara Falls foliage embraces fall, with tree leaves changing colours to reds, oranges and yellows before winter is ushered in. Be prepared for fall temperature highs ranging from the mid-40s to low 70s and lows from the low 30s to low 50s. You might even see snow in October, too. Winter in Niagara Falls is breathtaking, as sheets of ice and plenty of mist give the illusion that Niagara Falls has frozen over. It really hasn’t, but the spectacle is still worth seeing. Just be aware that certain attractions, like boat tours, might be closed due to weather. Expect snow throughout winter, and temperatures dip down to highs of low 30s to high 40s, and lows of teens to low 20s. Bundle up for events like the Niagara Icewine Festival, which takes place from January 11-27, 2019. Sample varietals of this unique wine, made from grapes that have frozen on the vine. Winter is holiday season, so you can see light displays at the Niagara Falls Winter Festival of Lights through January 31, 2019, and at businesses throughout Niagara Falls. If you’re in Niagara Falls in December, there are Christmas-themed events every day and night throughout Niagara Falls. 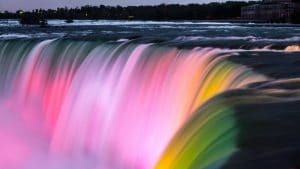 Whatever time of year you decide to visit Niagara Falls, you can find Niagara Falls hotel deals here. Visit to find Niagara Falls attractions every month for the whole family to enjoy.